Alex Cora, who won the 2007 World Series with the Red Sox, was named the team's manager 10 years later. 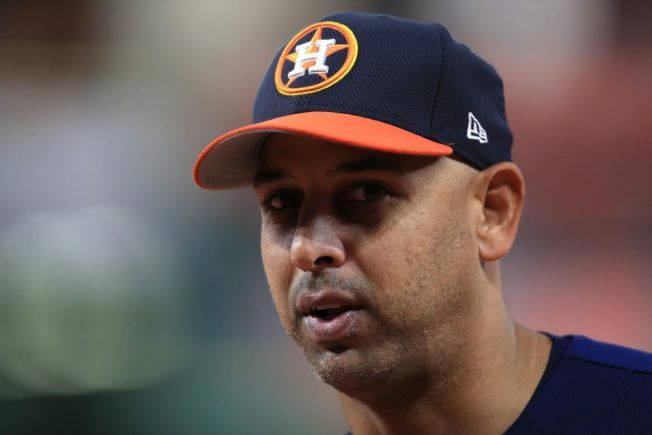 The Boston Red Sox hired Houston Astros bench coach Alex Cora to be their new manager on Sunday, turning to a player from their 2007 World Series championship roster to help the team out of its current playoff slump. The Red Sox announced the hire on Sunday, a day after Cora's Astros eliminated the New York Yankees in the AL Championship Series. With two days off before Houston opens the World Series against the Los Angeles Dodgers, Boston had a chance to hire Cora without running afoul of baseball's ban on major moves during the Series. "I am extremely honored and humbled to be named manager of the Boston Red Sox," Cora said in a statement released by his new team. "Returning to the Red Sox and the city of Boston is a dream come true for me and my family, and I look forward to working towards the ultimate goal of winning another championship for this city and its great fans." He added that he is proud to have been a part of the Astros' current postseason run. "I want to express my appreciation for Jim Crane, Jeff Luhnow, A.J. Hinch, and the entire Houston Astros organization for giving me the chance to start my coaching career," Cora said. "It has been a very special season and an incredible organization to be a part of and I am looking forward to the World Series and winning with this group." Cora replaces John Farrell, who led the Red Sox to the 2013 title and in the last two years claimed the first back-to-back AL East championships in franchise history. But Boston also finished last twice in Farrell's tenure, and the ballclub has won just one playoff game since winning it all in his first season. A native of Puerto Rico, Cora is the first Hispanic manager in for a franchise that was the last in the major leagues to field a black player. The Red Sox faced renewed racial scrutiny this season after Orioles outfielder Adam Jones reported being subjected to racial slurs at Fenway Park. A day later, a fan was banned from the ballpark for life for using racial slurs in the stands. Red Sox president Sam Kennedy said at the time the episode made him feel "deep remorse that these things happen in our society. "But it's the reality of the world that we live in," he said. "Hopefully, this is a step forward." Cora, who has never managed before, played 14 years in the major leagues before retiring in 2011, including parts of four seasons with the Red Sox. He was a lifetime .243 hitter with 35 homers and 286 RBIs. In 2003, he led the league in putouts and double plays by a second baseman. "Alex is a guy that communicates well with the players; he's a guy that studies the game," Astros designated hitter Carlos Beltran said this month. "His preparation is above what I have seen in baseball, and he has a great personality. "He's intense — players like to see it. But at the same time, he is a guy that can sit down in the clubhouse with the players and have a baseball conversation," Beltran said. "So he's got the skills and I love it. He's been a big help for this organization. He takes a lot of pride into relationships with the players."